Charlotte Kingsnorth presented a work of her biomorphic series Hi! Breed at the Reality Check exposition (September 2018). We caught up with her to find out more about this upcoming English artist and her new series. – Hi Charlotte, could you present yourself? What is your background? When did you get that feeling for design? Hello. I was born and raised in London. I realized I wanted to pursue a life of design while at school. I designed and made my first chair when I was 15. 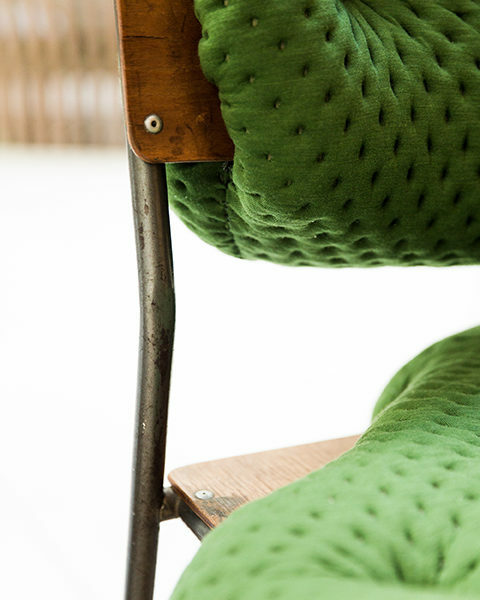 It was fabricated from layers of chipboard cut into the profile of a chair and stuck together. I went on to do an Art Foundation at Kingston, which was incredibly liberating. I did a further three years of study in Product and Contemporary Furniture design at Buckinghamshire University, and later a masters at The Royal Collage of Art. – You completed your Masters with designer Tord Boonjte. He often sought to integrate fashion into industrial design — an approach distinguishable from one aiming for practicality and its adaptability to the consumer. Where does your artistic approach fit into this? 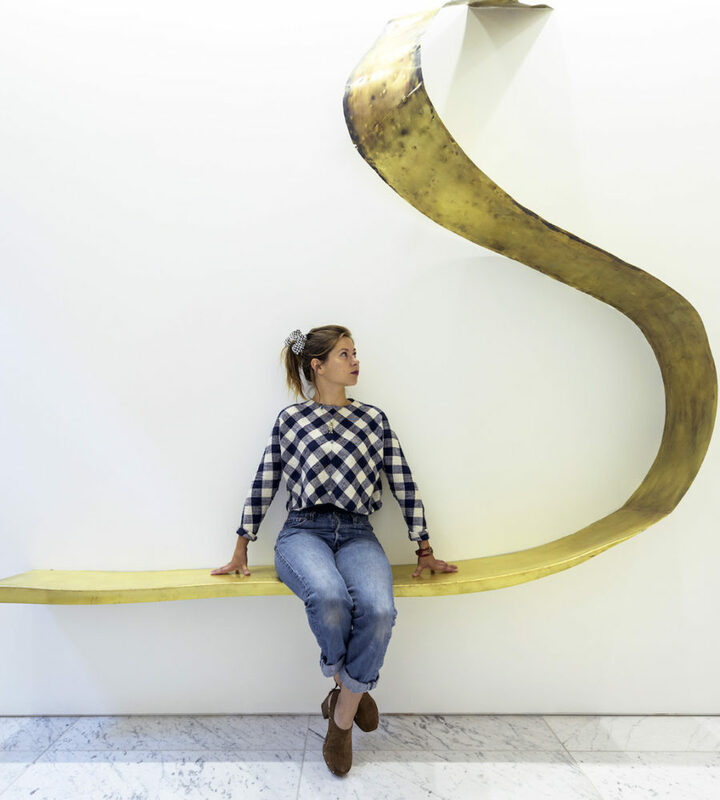 Was your experience at The Royal College of Art decisive for that matter? I think my style developed before the RCA. I was lead by this idea that I can tell a story through my work, expressing conceptual ideas through both industrial and traditional craft techniques. 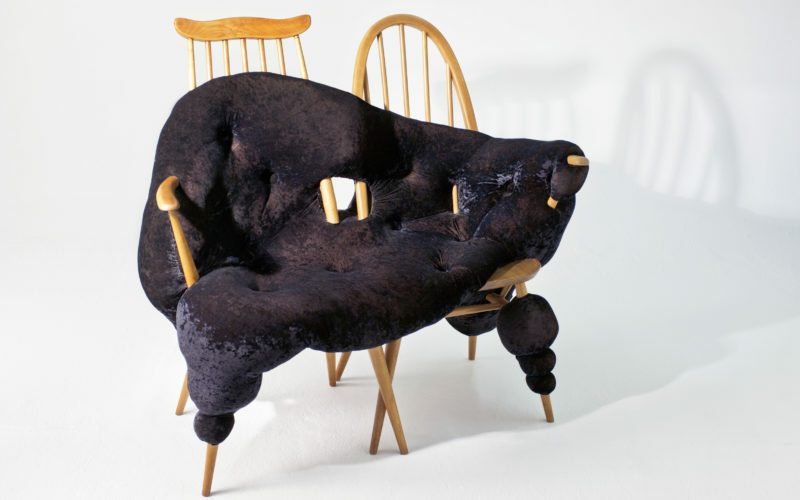 The first design that came from this way of thinking was the AtOne sofa, which I designed in my second year at Bucks for a brief set by Vitra for the D&AD awards. – Looking at the Hi!Breed series, what was the genesis of that project? What were your motivations? The idea for the Hi!breed series came from the AtOne sofa. 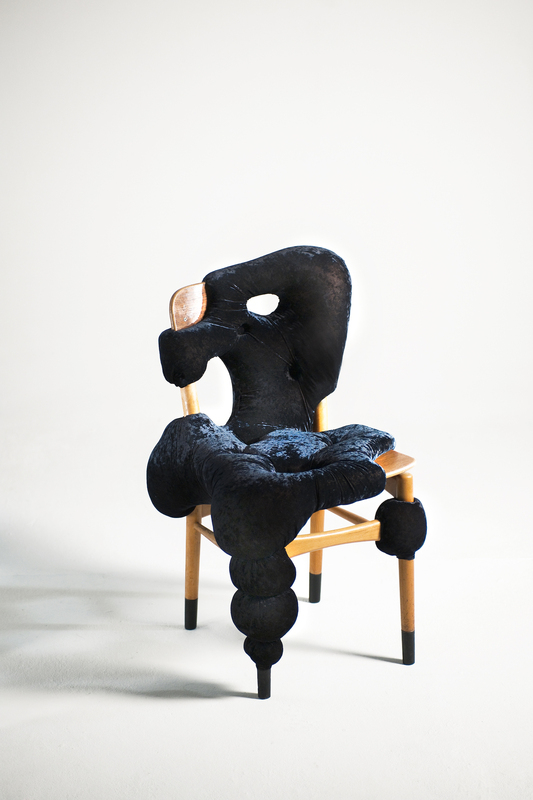 I wanted to start making chairs with this fleshy biomorphic upholstery, each one individual. I wanted to pull out the characters of these chairs to express the way I saw them. I made the first one while on a residency set up in a disused shop in the Brompton district during London Design week back in 2011. I had hardly any tools with me and was literally on my hands and knees stapling and stitching this thing together. – Your inspiration of the Mullca chair and other iconic models of the past century does not go unnoticed. A comment on the impact of design on our collective unconsciousness seems to take place in this series. Are you picking up on the role of the past of industrial design? — keeping in mind the significance of this collective memory. I love the clash between the more industrial chairs I use, with the addition of the soft handcrafted nature of the upholstery. I find inspiration in chairs that have been abandoned or need fixing in some way. I like that they have a hidden story and a history. They may have lived in many different houses, or lived through generations in the same house. They have ended up in a second hand shop and wait for a new owner… or maybe they have been thrown out and are waiting by the roadside ready for landfill. I want to intervene at this stage and patch them up with my upholstery. It is a play on Kinstugi, a Japanese philosophy applied to broken ceramics. The broken pieces are glued back together with a golden lacquer as a way to celebrate the breakage as part of its history rather than to disguise it. This can be seen as a reason to keep an object around even after it has broken, highlighting the cracks and repairs as simply an event in the life of an object rather than allowing its service to end at the time of its damage or breakage. The original inspiration for these chairs was from a trip to Mexico; I saw some old generic white plastic picnic chairs which had broken. Someone had fixed them up using plaited palm leaves and given then a new lease of life. The chairs were not only saved from landfill but had an added layer and personality that was more enriching and valuable. 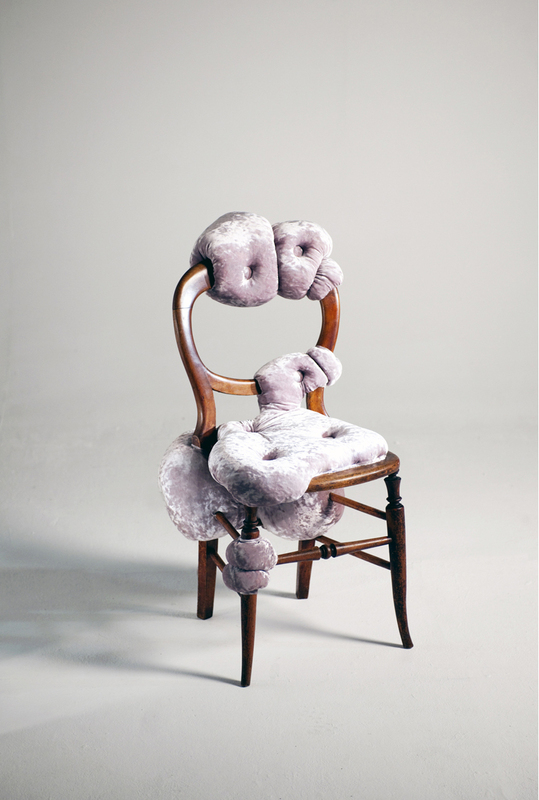 – As if the iconic chair — or the memory we retain of it — had undergone a mutation, your work takes the form of an alluring chimera. Midway between runny polyurethane and delicate velvet, an almost parasitic slime seems to spread. 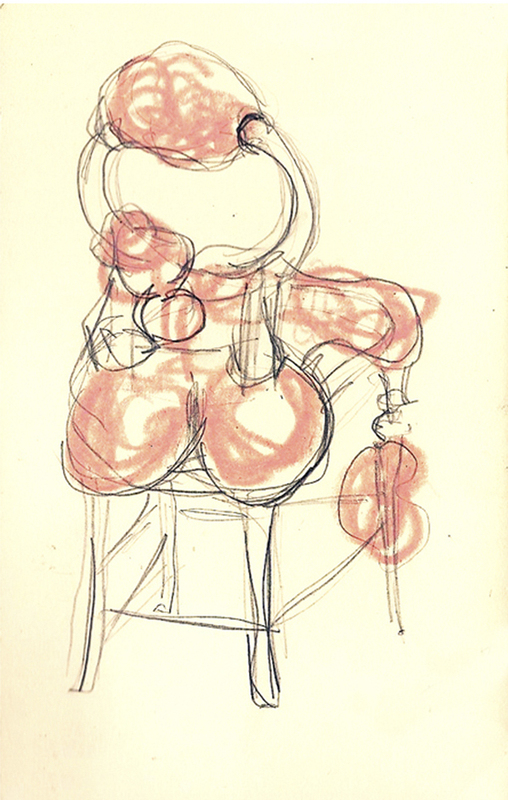 After anthropomorphism, we find ourselves confronted now with biomorphic designs. How do you conceive this oozing ‘chemical reaction’ in your design? My process is lead by intuition with a hands on approach. I sketch the chair several times from all angles. I like to have an idea of it on a 2D platform and to sketch out its anthropomorphic character. I use sketches as a guideline and base the foam sculpting on these. Its then a process of addition and subtraction until the balance of the piece feels right. It’s a very haptic process. – Viewers at the Reality Check exhibition understand that fantasy and phantasm are but matters of acquired approach and perception — as much by the artist as by the public. Yet the artist depends in a way on the public’s disposition to accept these shifting realities. What role — or even responsibility — does the public hold in your artistic process? I want to share my love of furniture and enjoy exposing my perception of things.. but I don’t expect anything from the viewer. They take from it as much as they see… like anything in art or life in general. You like it, you don’t like it, or you are indifferent to it. It’s all subjective. – When Art Nouveau inspired itself from the fauna and flora, we considered it an exploration of the natural world. In this new era where genetic manipulation and transhumanism has become a reality, can we still consider this a biological exploration? — one of its own day and age. I am fascinated with the idea of ‘the self’ and our awareness of our ‘outer-self’, the perception of ourselves through others… we become two parts. Once we are aware of these outer layers, they can become interchangeable. Skin is a two-dimensional layer and with the addition of body matter it becomes a three-dimensional form. There is a complete spectrum of body shapes and sizes that all fit within the label of being human. Whilst some people fit comfortably within this grouping, others continue to purposely push the boundaries as to what is known to be ‘normal’, with ever new self-applied mutations to the body. The definition of a mutant often conjures up images of monster characters from comic books. However, following Darwin’s ideas on evolution, mutation is a very normal process and is part of the natural journey that continues human evolution. Just as roses have been cross-bread over generations in order to obtain the perfect shape, scent, longevity of bloom etc., mankind is fascinated with adapting our natural form and the endless combinations we can evolve. In terms of genetic manipulation, we are at the crux of a paradigm shift. We have the science and capabilities to play with nature and biology.. but we do not have the foresight to predict its outcome. It is both exhilarating and terrifying in equal measures. – Do you believe that the development of new materials and technology has impacted the world of design? Biomimicry has had a huge part to play in our development of new materials and technology. We as designers constantly look to nature for answers on how things can function and respond. I think we are at a very exciting time with design and the exploration of new technical and intelligent materials. I often direct my inquiry of material research directly from the latest research from NASA. That’s where the serious money is invested. – Looking at the return to a pseudo- vintage style, how do you explain this rediscovered interest for a style of another time? I do not get involved in fashion and trends. They suggest there will be a time when the object is no longer favourable. – Are you currently working on a particular project? Others in the forecast? Yes.. I have several exciting projects coming up.. Watch this space!